I found myself immediately drawn in by Fidge (10 ½) and her entirely understandable irritation with four-year-old Minnie and that wretched Wimbly-Woo story. It’s funny, utterly relatable – and then things take a turn for the worse. There are some proper heart-stoppers in this (no spoilers, but you’ve been warned if you’re as soft-hearted as I am). Soon the reader ends up in an extraordinary, verging on hallucinatory, otherworld. It’s both great fun and full of peril – as if to escape from Disneyland’s It’s A Small World ride would need Indiana Jones level skills. You laugh on the inside and shudder at one and the same time. Love it. It takes almost the whole book to get back to ‘normality’ – but as in The Wizard of Oz, the main characters are not the same after their adventures in an alternative world. The strange echoes of famailar things truly matter. Totally not then I woke up and it was all a dream. There’s a good deal of psychological truth in this story – but no preaching. Indeed, psychobabble gets a well-deserved mauling. Sensitve topics such as grief and lossare handled with intelligence and warmth. I’d recommend Wed Wabbit as a read-aloud for quite young children where they can discuss the story and its implications. More experienced readers will find the prose zips along, leaving lots of space for laughter and thought. I love the tagline – Don’t laugh. He’s dangerous. It’s true. He is – but you do have to laugh. Overall, Sarah McIntyre’s cover conveys it perfectly – Wed Wabbit’s shadow is both menacing and ridiculous. How right to have a book that takes a child’s perspective seriously – yet makes us share a giggle or two. An over-used phrase, but it could well be a future classic. 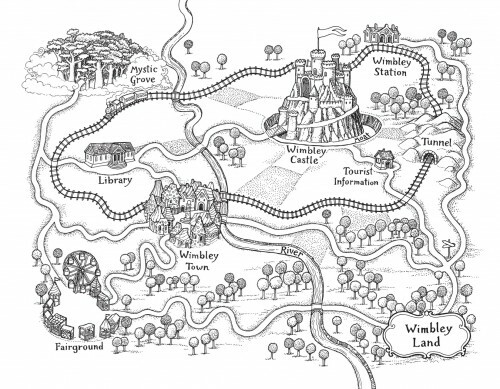 Map of Wimbley Land by Tomislav Tomic c/o DFB website. Graham – a brilliantly loathsome character worthy of Roald Dahl, but so much more than that by the end. In fact, I’d nick all the characterisation skills. How everything in the initial five chapters pays off in the rest. Humour as a way to deal kindly with some pretty deep and upsetting emotions for a child reader. Reminiscent of The Phantom Tollbooth by Norton Juster – cleverness with heart and humour. Send up of treacly rhymes – hootably funny. Gloriously visual – I’d love to see a graphic novel version, or a TV cartoon. The map ( by Tomislav Tomic) . I so want to colour it in, and when you’ve read the book, you’ll know why. Published by David Fickling Books. I have become increasingly fond of their packages dropping through my letterbox: DFB means Damn Fine Books in my mind. 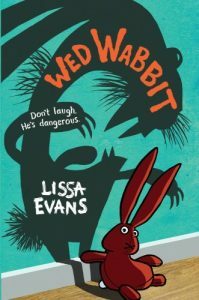 This entry was posted in Review and tagged #writersreviews, David Fickling Books, Lissa Evans, MG, Wed Wabbit by KMLockwood. Bookmark the permalink.